I first started backpacking as a teenager in England. I did a month-long trip in the Arctic but most of my backpacking experience has been weekend to 10-day trips, in a range of terrains and climates. I am a volcanologist so I also do day hikes carrying loaded packs over intense terrain. Nowadays I am nearly always in tropical climates. I am heading increasingly towards ultralight packing, and unless I am sharing I use a bivy. I try to pack under 20 lb (9 kg) for long weekend trips but have carried over 50 lb (23 kg). 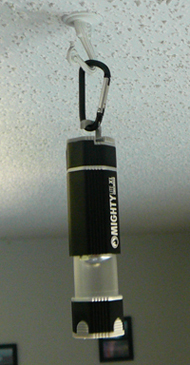 The torch comes in a plastic hanging container like those used for displays in shops. It was posted in a padded envelope with a catalogue of other Industrial Revolution products. In the plastic case there was a 2-sided sheet of card detailing the features and uses, and stating that it has a 1-year warranty against defects in material and workmanship. There was also a sheet of paper that explained the setup of the different components. The torch takes 3AAA batteries, although the website originally said that it took AA. I contacted the company via the website to point this out and got a really nice, prompt email back thanking me and telling me that the website had been updated. To install/replace the batteries the end cap is unscrewed and removed. 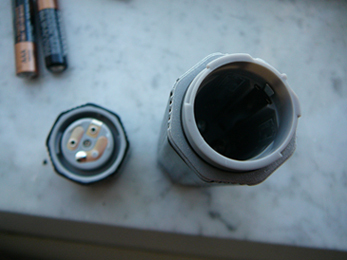 The batteries are inserted according to the polarity labels inside the torch. The cap is twisted until it fits on the track, when it is pushed in and screwed on until the close label on the cap aligns with the black line on the body. To turn the torch on, the triangular switch is twisted from off to on. According to the manufacturer the LED bulb never needs to be replaced. 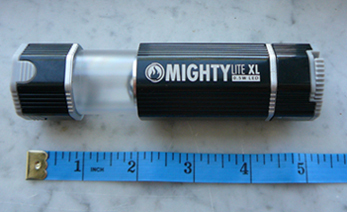 The UCO Mightylite XL Lantern and Torch feels like a solid little piece of equipment. 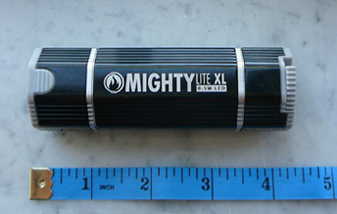 The aluminum body is black, with 2 borders left silver; one where it pulls apart to change from a torch to a lantern, and one where the cap is attached to the body for inserting the batteries. The casing of the bulb and the end of the cap are grey plastic, which I was not as impressed by as it looks a bit cheap and less sturdy than the rest of it. To change it from a torch to a lantern is really easy as it simply pulls apart, and there are ridged parts near the bulb to give grip. It slides smoothly but does not feel like it would come apart by accident. 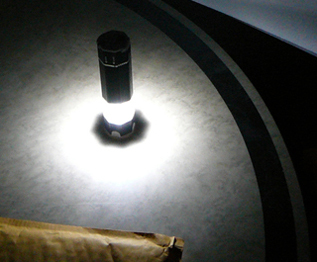 When in torch mode the plastic is clear for the light to shine through, whereas it has a slightly opaque tint to the plastic forming the lantern. The instructions to install the batteries are clear, but there are 2 things that worry me about it. One is that the polarity labels are fairly far down inside the body and are a bit difficult to see (particularly at dusk, when I am most likely to discover the batteries are low). The other is that there are two tracks and a notch to line up the body with the cap, so that it can take a little while to fit them together. If I check inside first it is easy, and I suppose it makes it less likely for the cap to come off, but it is a bit of a pain and slows things down. 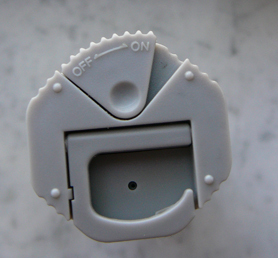 The switch to turn the light on is a triangular one that rotates sideways and has ridges on the end for easy sliding. Because it is semi-circular and the housing is octagonal they do not line up exactly which makes it easy to turn on, but that also makes it easy to turn on by mistake. Even installing the batteries for the first time I accidentally turned it on! On the cap there is also a hook, which is hanger shaped. It clicks up and down so that there is no fear of it accidentally falling open, but it does feel like it would be the first thing to break. As it is an open loop I am also worried that the carrying strap might come off the loop when I have it hanging under my hammock and am swinging. Also, as the torch is black I am worried that it would be hard to find if I do drop it in the dark. 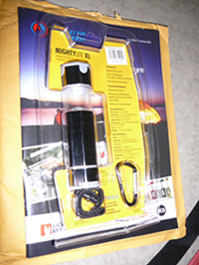 This lantern has been used on a number of backpacking and kayaking trips, as well as a 12-day Road trip. The first backpacking trip was to Great Smoky Mountains National Park in North Carolina. We hiked 16 miles (26 km) over 3 days, with elevations between 1700 ft (518 m) and 5850 ft (1780 m), and temperatures between 35 F (1 C - our tent was pitched in snow one night) and 75 F (24 C). The other backpacking trip was two days hiking in Withlacoochee State Forest in Florida, again over 16 miles (26 km), but the minimal elevation changes and more moderate temperatures of 55 to 75 F (12 to 24 C) made this a much more laid-back trip! The 5-day kayaking trip was to Ten Thousand Islands in the Everglades, and the other kayaking trips were in west-central Florida, all with typical warm, sunny weather similar to Withlacoochee. On a Christmas Road trip to Montreal and around the northeastern USA, temperatures got down to 6 F (-15 C). The lantern therefore dealt with snow and splash from the ocean, but no rain. The biggest beef I have with it is that it is pretty heavy, at least compared to my headlamp. It does seem very sturdy and durable though. In lantern mode the pool of light isn't huge either, but that makes sense considering its small size, which allows it to fit anywhere in any kind of pack or my kayak. My worry about it accidentally turning on has proven unfounded - it is stiff enough that it never turned on accidentally in my pack; in fact my headlamp was the one that I kept finding on! Although I do like the hands-free functionality of a headlamp, this lantern has proven really useful and definitely up to the tasks it is designed for. In the tent I don't bother with anything else, and around camp it is always handy for when some extra or more diffuse light is needed. I added a loop to the tent to hang my torch from. 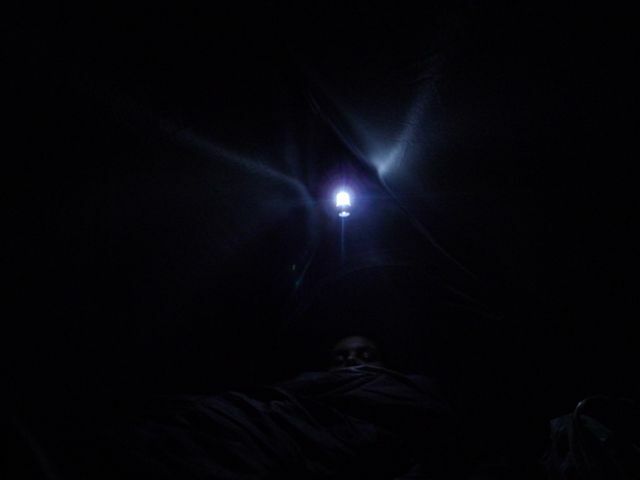 Me in the tent with the torch. Camera flash is on. 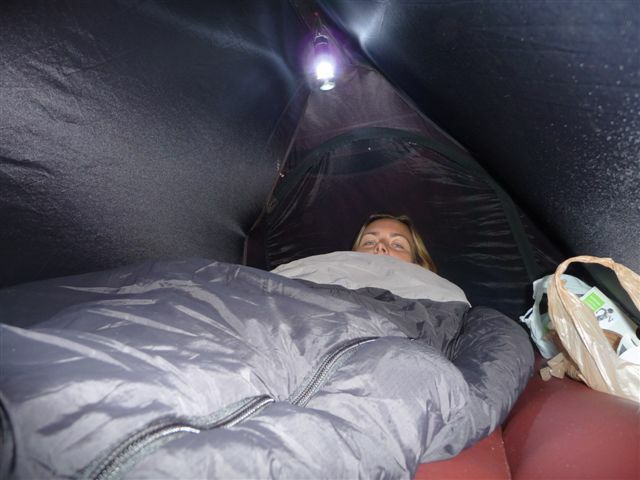 Me in the tent with the torch. Camera flash is off, so the torch is the only lighting, about 5 feet (1.5 m) from the camera. The illumination with the camera about 3 feet (0.9 m) away. As well as the diffuse light, the beam shines down too. The torch feels very comfortable in my hand. 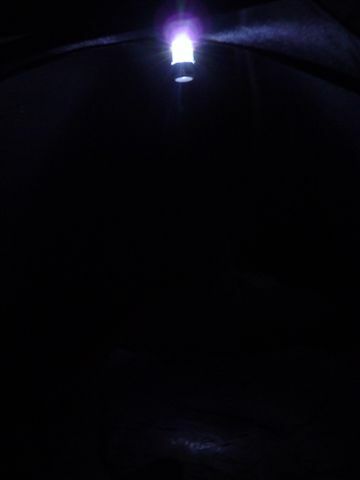 When it is in torch mode some light still comes through the side connection. This flashlight came with me on a 2-night backpacking trip to Suwannee State Park in northern Florida, where temperatures varied between 35 F (2 C) and 75 F (24 C). There were minimal elevation changes, but the trip still had its moments (forgot hiking boots so had to buy cheap sneakers, got in a fight with a squatter, camped in a huge lightning storm, 20 mile/32 km route turned out to be closer to 30 miles/48 km, and would have been even longer if we hadn't got a ride in a pick-up with dead fish, and car broke down on the way home)! I have also used the torch on a car camping trip in central Florida and a moonlight canoeing trip in west central Florida looking for alligator eyes. I have carried it on day hikes and in my car, but never needed to use it. The only thing that has really changed since the field review is my thoughts about the strength of the bulb. 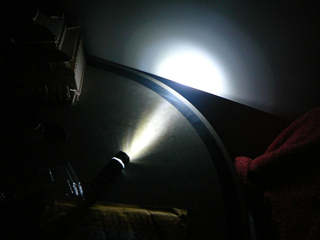 The flashlight I had been comparing it to died soon after, and comparing it with a new, super-bright headlight the beam seems quite dim. It is still perfectly adequate though. I put it in the same place as when I first got it and the beam looked exactly the same, so hopefully the bulb will last as well as the manufacturers claim. I also tested the battery life using new, cheap alkaline batteries. It lasted just under 23 hours before the light started to dim, very close to the claimed 22 hours. After 26 hours it was noticeably dimmer. I turned it off because I was leaving the house, and when I came back it wouldn't turn on again. With new batteries it was back to full beam however. A few hard knocks and getting splashed when kayaking has therefore not seemed to do it any harm! Overall it is still a sturdy little light that is especially good (in my opinion) when I hang it up in lantern mode inside the tent. 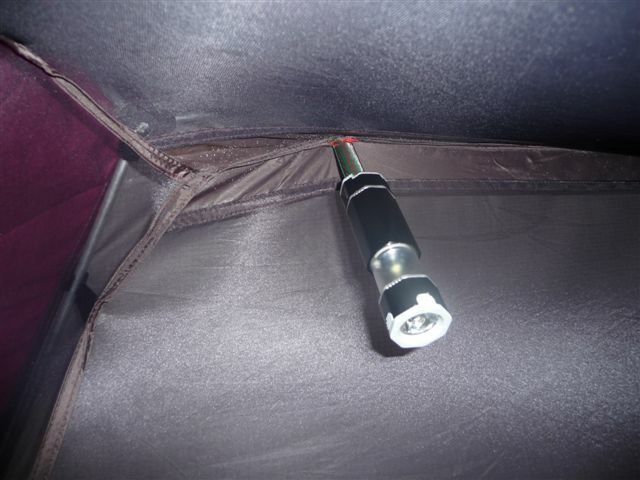 It is just the right strength, and the beam is diffuse enough that I can see everywhere in the tent. I still haven't used it with the included lanyard or carabiner, and as they attach to the open loop they tend to get lost in my bag. The loop has been good enough for everything I have needed it for anyway. I like the size and feel of the torch - it fits well in the palm of my hand, and when I need light and free hands it even fits in my mouth! That is not particularly comfortable though. It also fits in my purse which is nice if I am going out late at night. Initially I worried that being black I would lose it, but the size and shape of it is very distinctive in my pack, and when I haven't been able to see it in the dark, I haven't been able to see any other colors either! I think the color looks good and I don't notice the cheaper-looking plastic that the light shines through in lantern mode any more. I really like the dual functionality of the torch, but find that I use it more in lantern mode. It hasn't replaced a headlamp for me, but supplements it really well. This is a great little light that has definitely earned its place in my backpack. It has not shown any signs of wear, and the battery life is pretty good. The dual-function lantern/torch is great, not just because of the versatility, but also because it means that the strength and diffusivity of the beam can really be controlled. This concludes my Long-Term Report.�Many thanks to BackpackGearTest.org and to Industrial Revolutions for the opportunity to test the Mightylite XL Lantern and Torch.